Every holiday I try to make a dessert to match the holiday because I’m crafty like that. 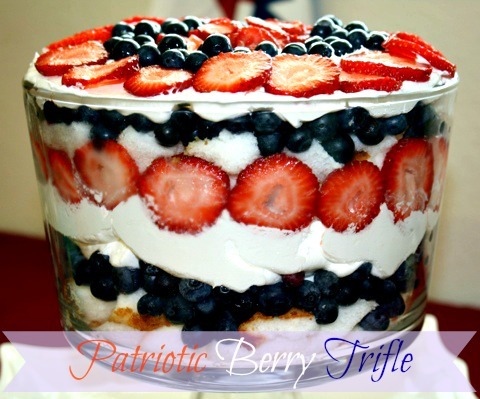 This Fourth of July, my birthday by the way, I tried a recipe from Sunny Anderson for her patriotic trifle. Well I adapted it because I was lazy and trying to be somewhat healthy so instead of a heavy cream I used Lite Cool Whip. We ate this on the Fourth with our holiday meal. It was a sweet, simple treat. If you haven’t caught on yet, simple is my middle name. Heat sugar, lemon juice and water in a saucepan over medium-high heat. Stir until sugar dissolves. Once done, remove pan from heat and stir in extract. Arrange half of the cake cubes in bottom of trifle dish. Sprinkle evenly with a layer of blueberries. Layer a good portion of Cool Whip over the blueberries and gently spread. Top with a layer of strawberries. Layer remaining cake cubes on top of strawberries and repeat with blueberries. Add Cool Whip and spread evenly. Finish with the remaining strawberries and blueberries, arranging them in a decorative pattern. Cover and refrigerate 1 hour. Note: to get even slices of strawberries, trim top and bottom then slice with an egg slicer.